The Options Committee of Making Kenora Home is proposing the sixth poverty challenge, A Walk in Other’s Shoes. This year, we have asked our local business community to take the challenge. Participants have been asked to attempt to stay within a social assistance benefits’ budget. A single person on Ontario Works would receive $305 per month, $10.00 per day, or $50.00 for the five-day period. A couple would receive $468 per month, allowing a daily budget of $15.60 or $78.00 for five days. The budget includes all food and drink, entertainment, some personal supplies and transportation costs. Each participant will be given a daily challenge card, which will reveal an additional challenge to be completed before the end of each day. The participants will experience some of the hurdles that people living on social assistance face. It is hoped that the event will raise awareness and break barriers for people living in poverty. The challenge takes place February 16th until February 21st, 2016. Well it's the last day of the challenge ... I've yet to look at what remains mine for today, just wanted to enjoy this coffee before I open it up. I have started to look at how many things I've used these past few days and taken for granted, oven mitts, aluminum foil just to name a couple. My mitts are worn out and soon need to be replaced if only with dish towels, what does it cost to be replaced? I gave no thought to how I'd cover my gourmet tuna casserole, but there was some aluminium foil like so many things we just have, items in our kitchens in our lives that are part of our inventory? Items we regularly 'need' and so are just things we always have. The last 'challenge' ..... "your dog is sick, what do you do?" I thought I'd been lucky with the daily challenge cards all week, and worried it might be time for my luck to change. I was a bit nervous about opening up this last card. It isn't always good to be right, and my first reaction when I read it was............. 'your dog is sick, what do you do? The thought of it brought back the memory of other moments with pets when they were seeming off, and the question begins, oh no, what's wrong? That's the hard part, the not knowing. If Emma were sick this morning I'd do what we've done in the past and spend the next 30 - 60 minutes monitoring and watching her behavior, checking for any visible wounds, cuts etc. try and figure out what was going on. I'd tempt her with a treat, which today would mean a piece of cheese, and see if she'd take any water and keep it down. I would watch her trying to determine what was wrong, if it was serious to see if she needed to see the Vet. This challenge raises a highly personal question and from past experiences I've learned, you can't tell when a pet first seems off whether it's a minor problem that will pass or if it's the first indication of something much more serious and potentially life threatening? We've had both, and historically we're quick to get to the Vet's for their opinion in hopes of being told they've just pulled a muscle or could have gotten into the trash which has upset her system. Or then there is the other possible outcomes. Either way, this challenge confirms what I think all of us taking part in this know, we wouldn't have pets. We couldn't with the limited amount of money we'd be getting from OW. There just wouldn't be any debate, if I was someone on OW assistance, it would be impossible for me to think I could look after a pet and offer them all they needed for a good and healthy life. Given how much I love and enjoy Emma, or any of the other pets we've had, this challenge forced me to accept the fact that I would no longer have the option of having a pet, it would be out of reach; unaffordable. So while I've got enough food left for today, a couple dollars to spare and planning on shaving, which I know is going to feel good, I'm feeling the weight of today's challenge. Thankfully I have a healthy pet just underneath this desk as I write this blog, for which I'm extremely grateful, and also pleased that this is the last day I'll be trying to walk in these shoes. But when asked if Emma were so sick today that I felt she needed to see the Vet and I had only the assistance of OW to rely on, 'what would I do"? I really don't know, but I'm sure whatever it was, it wouldn't be without tears! day 4 and my challenge is to 'buy a lottery' ticket. Where's the hardship in that, except that I don't have $5. Hmmmmmmmmmmmmm think I'll see if I can get someone to go 50/50 on it? We're getting down to the bone. I know I've got enough food, and have allocated $1.50 for my coffee in the morning, but leaves me with less then $2.00 for anymore surprises? But there is the chance I'll win on the ticket, is it an act of blind optimism, or a lack of any common sense? It's all a mater of perspective? I'm choosing to belief it's an act of hope, and that I'd rather take a risk no matter the outcome? I've got the last of my chicken for supper tonight with more rice, smothered in margarine and some sauted kale ... that leaves a chicken leg/back for tomorrows lunch. I'll have soup with a cheese sandwich for lunch and there's plenty of oatmeal for tomorrow breakfast. The worry is what remains tomorrow's remaining challenge. The worry is as it's been all week, will I have enough money to get me through, will it last? It's a dreary day but I'm headed out to buy my ticket, and also get some exercise, something I've not done for the last few days ................ it's mild and I'm hoping the fresh air and a lottery ticket in my pocket will lift my spirits. I'm feeling a bit disconnected, withdrawn and not wanting to do much or go anywhere ... I'm not having much fun being so preoccupied with what I don't have, or what I might be wanting, or worse what I may come to need! I dread going to the store for a few groceries, and having the sense of walking the wire. Trying to stay focused on what I can afford and overlooking what I'd like but have to do without! The continual attention to what you don't have and what you need become more predominant, and the idea of a trip to the store seems to reinforce my instinct to retreat. I think the longer we go with the consequences of having to do without, the more it chips away at our sense of self,. Our psyche is malnourished as well as our bodies and how can it not challenge our sense of well being ! Or am I just coming down with something? The unseen consequences of feeling like you don't have much on the shelf or limited at best continues to enter into a day ............ the limitations continue to extend into your day to day, not only with what we may not have in the cupboard, but how you'll spend your time. Got a call from a friend who was in town and wanted to get together, come by as she put it. I was happy to hear from her, and initially was excited to call back and say yes come by..................I'd love to see you. Following my enthusiasm came the real question, what would I offer her? I knew I couldn't offer her the usual cup of tea as I didn't have any or anything sweet to go with it, and while I could explain to her about the 5 day challenge, it brought home the fact that these conditions I'm willing to assume for a few days could have a real impact on those who's lives we're trying to emulate. How much socializing includes food, or is central to the activity? The contrast was my challenge for the day which was to go to a potluck or office party with a food dish. I met the challenge and made what I could have taken, and then invited a friend to join me but think I may have been somewhat embarrassed by my offering. It was a very skimpy casserole ... a casserole of white rice/ a can of tuna fish, some chopped scallions, and chunks of cheddar cheese. It was a small dish and a bit sad, but it was my contribution, and to our surprise not so bad. We had enough and got to laughing during dinner about making a cookbook titled something like 'Great Recipes from Ontario Works' ................. but we didn't have the snacks before or dessert, but perhaps had there been a pop luck supper somewhere last night I would have been more fortunate? Today I feel blessed as my challenge is to accept an invitation to go out for lunch or supper. I did open up my card today with real hesitation as my coffee fund is dwindling, and I need to get some personal supplies. I'd been thinking I could go the span with less, I do have access to some at my work, and have slipped off with a roll of TP ............. (is that cheating?) I think I would overcome my moral compass if I were truly living on this limited budget and had products available. I think I might even be arrested for shoplifting if this went on for to long! Yesterday in the mail a sample of deodorant arrived attached to the catalogue you could order it from. Something free! What a bonus, and something useful, something that would make it possible for me to get something I may really need. It felt like such a gift ... and it was! I think these economic conditions are the great leveler ... it becomes very difficult to do with less in the midst of those with more. It is very difficult to ration out your meal based on your means and look at the difference between it and what someone with more calls supper. It's impossible to for the have not's to co-exit with those that have. Yesterday's lunch for Rob was left overs from the night before ... warmed up but still some good slices of meat loaf on a bed of organic couscous, smothered in melted sharp cheddar cheese and a side of mixed green salad. Normally we would have shared it. I on the other hand had half of the 4 cups of soup my dry mix makes with 2 slices of whole wheat toast, and a glass of water. I'm drinking more water, in an attempt to keep from feeling so hungry? I'm not sure it's working ... but it is temporarily filling. Dinner last night forced the issue and so Rob and I shared my menu ... chicken with rice. I had a large bag of rice so I've more then enough for my week, and I was happy to share the chicken rather then deal with preparing a separate main course for him. I used the dripping from the chicken to flavor the left-over rice which I'll add the second half of the soup I made yesterday have for lunch today and 2 more slices of toast. I'm splurging on a 3rd cup of coffee this morning, and hesitant to open my challenge for the day .. I'm electing to delay for a bit ... I want to enjoy what's left of the morning before dealing with the unexpected. Found the help of my friends was my way to try and answer today's challenge of getting a new shovel. But it did mean having to ask ... most said go to Canadian Tire, or a hardware store ... lol (they didn't know I'd begun this challenge) I found one, but it will mean walking to Lakeside to get it but it would have taken much longer to find so many willing to help without access to the internet. I'm in trouble ... 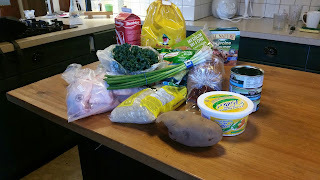 I just spent over $33.00 for these groceries and not sure I've enough food to last the 5 days of the challenge. $1.00 spent on coffee and my breakfast cost are also gone so there's little left to meet the unexpected and what I've got will be bland given I've so few spices/seasoning to add to any of it. I bought white rice not brown, margarine rather then butter and yellow cheese in an attempt to save money! Perhaps it's time to consider fasting for 2 of the 5 days? Brief description of you: semi-retired, community volunteer, , enjoy film, music, literature, dining in and out as well as entertaining.